There's a theory that the Outers are nowhere to be seen because they're in their respective castles guarding the Outer Solar System... But it's kinda of sad to think that they'd be back to their Silver Millennium duties and completely alone. 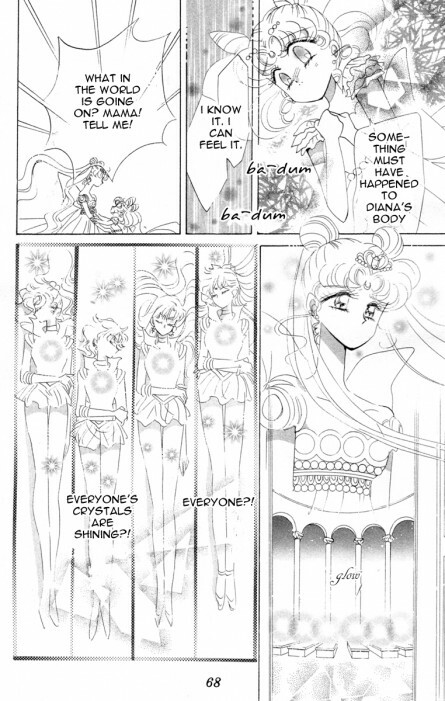 It's also bizarre that Sailor Pluto seems to exist in Chibiusa's future (she sacrificed herself during the Black Moon arc and was reborn in the 20th Century), and that she's in her super form while the rest of the senshi are in their basic forms (though apparently Naoko forgot that Mercury does not have shoulder pads in the manga ). Flipping through the manga again, and the stuff about the Death Busters' causing an aberration in destiny (and destiny/time similarly being said to be getting altered in Stars) is completely contradicted in the Dream arc when Saturn insists that destiny can't be altered (in response to Nehellenia's taking credit for her curse causing the collapse of the Silver Millennium). So which is it? Either destiny can be altered (in which case let Nehellenia gloat) or it can't. Either Saturn, Uranus, and Neptune should be awakened in Crystal Tokyo or they shouldn't be. Anyway, while the Outers may typically be at their castles guarding the OSS, surely that goes for Pluto, too? She should at least be guarding the Space-Time Door? And yet her body was still in that room with King Endymion's and the Inners'. So even if Uranus and Neptune are normally posted at their castles, shouldn't their bodies be in the Crystal Palace along with everyone else's? Think of it as she didn't create the characters yet to know they'd exist in the future. They're just "elsewhere" for the purpose of the story. For manga reprints it would have been nice to have them included or at least the outfits re-drawn to look eternal. There we're tons of re-draws for re-prints that should have been one. 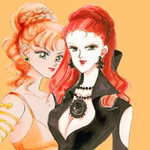 Well just because Chibiusa didn't recognize Sailor Uranus and Sailor Neptune from the future means nothing. I mean really she didn't recognize the past forms of her mother, father or the Inners. Also I think Sailor Saturn was meant to awaken in all timelines. and I imagine that Sailor Uranus and Sailor Neptune might have gone back to their jobs guarding the Solar System from outside invaders. 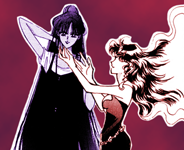 Speaking of Sailor Saturn there is this person called Mangaka-chan who did this excellent Chibiusa and Helios fanfic taking place in Crystal Tokyo in the future and they basically had that after the events of Sailor Stars after Crystal Tokyo was founded Hotaru went back to her planet of origin Saturn and went into a sleep and was awakened when Chibiusa finally came back to Crystal Tokyo full time. We even got a scene of Chibiusa hugging her old friend in a very touching reunion. Maybe she just forgot? She never gave a clear answer on what happened to Luna, Artemis, and Diana by the end of the series. Uranus and Neptune were probably off at their respective stations based in the Outer Solar System guarding its boundaries from any potential external threats. Those seen fading away in those pages above were likely the specific Sailor Senshi who were stationed on Earth and in Crystal Tokyo at the particular time that Chibiusa witnessed their disappearances. Likewise, Saturn might have simply been elsewhere (perhaps off-planet too, even) at that time as well, rendering Chibiusa similarly unable to first behold and later recount Saturn's own vanishing. In regards to Pluto's inclusion, we see in the Black Moon arc that the Crystal Palace has its own Space-Time Door that can access the area where Pluto stands guard from the other side of the door, so her particular station (by that point in time) has an exclusive means of direct access to the palace in Crystal Tokyo, allowing Pluto to simply walk to Earth from her post in no time at all (pun not intended). Whereas Uranus and Neptune, from what all we can tell, don't seem to have that specific luxury at their respective posts. Even if I accept that they're at their respective castles and that's why we don't *see* them in this scene, I don't get why we couldn't have gotten some dialog from NQS saying she's worried about them. It's not just that we don't see Uranus, Neptune, and Saturn in the future; we never hear about them either. Why return back to their duties and not be on earth? Their new lives were to be reborn l.
They were reborn on Earth, yes, but their original mission never ceased to be. They were just doing it from Earth in the 20th Century. By the 30th Century, since a new Silver Millennium had been established on Earth in the form of Crystal Tokyo, we can only speculate that Uranus and Neptune needed to go back their original posts in the outer system to stand guard over the whole system once more. All I can guess about that is that it simply might have not been necessary for the story that Naoko was trying to tell in the way that she wanted to tell it. After all, she had so many characters to juggle around by that point that keeping every one of them in check at all times in all settings might have been a feat in and of itself. I mean, she's only human. Well think of it as someone has to guard the outer boundaries which would be their job. Also what is a scout? ....you mean senshi? Ultimately, does it really matter since Uranus and Neptune are seen at the wedding in the end of the manga? The wedding does take place in Crystal Tokyo. By that reasoning, there was really no point in showing the Inners, King Endymion, and Pluto either. It wouldn't have killed Naoko to draw three extra characters. If Crystal ever makes it to Stars, I'll be very interested in whether they continue to adapt the manga with zero critical thought or if they add Uranus, Neptune, and Saturn to this scene. Again, she showed Pluto, who doesn't live at the Crystal Palace either. Again, she didn't have to show Uranus, Neptune, and Saturn, just mention them. The manga is a work of fiction, not a documentary. Naoko could have shown them if she wanted to. The question is whether or not their absence was an oversight on her part or if she deliberately meant to not include them, and, if the latter, why? Lets say Naoko decided that the events from Black Moon arc and/or Infinity arc changed something in the flow of time and now the future for current Usagi&co will be different from what we saw in Black Moon arc while said future we saw cant be changed/affected anymore. But thats wrong because we see future inners and Mamoru being affected by their 90s self losing their star seeds. Then lets say Naoko decided that the whole situation is a clear plot hole and it cant be salvaged so she just decided to go along without touching the subject anymore. BUT again that didnt work. In Stars, in the future we see Pluto having her Dream arc fuku while the inners still have their second arc fuku's. Why is that? How come Pluto senshi powers got upgraded while the others didnt? How come she's not in her Stars fuku anyway? How come two Pluto's exist in the first place? Wouldnt it be too dangerous give their power to control time? 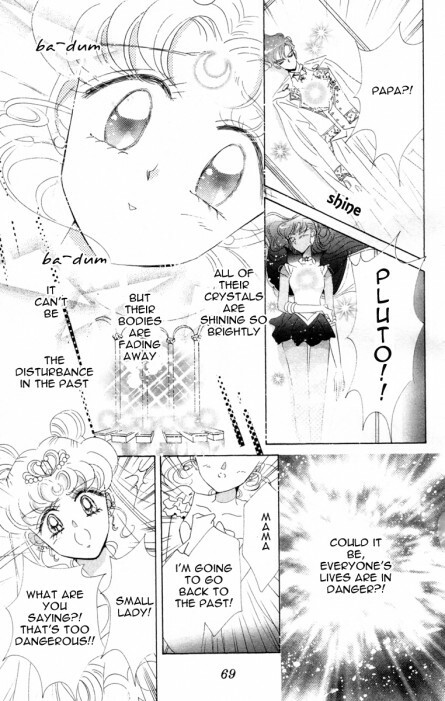 I Chibiusa is calling Pluto in the scene , the scene seem to be at Chibusa viewpoint Pluto has a door, so she could visit anytime. My guess is simple they do not live there. Both Huruka,Saturn, and Micheru are probably at the post. I always assumed that Chibusa timeline is an old one.When she went back she caused another one.